I love paradoxes, including this one: happiness is unique AND happiness is universal. A chalkboard in front of The Happiness Paradigm A-frame captures individual responses to the question, “What makes YOU happy?” Some of the recent answers have been doggie kisses; ukuleles; snow; Baby Charlie; and video games. Not everyone likes video games or, if you can believe it, ukuleles. And most of you don’t even know who Baby Charlie is! But happiness research, which started, oh, around the time of Aristotle, has found consistent paths to happiness. 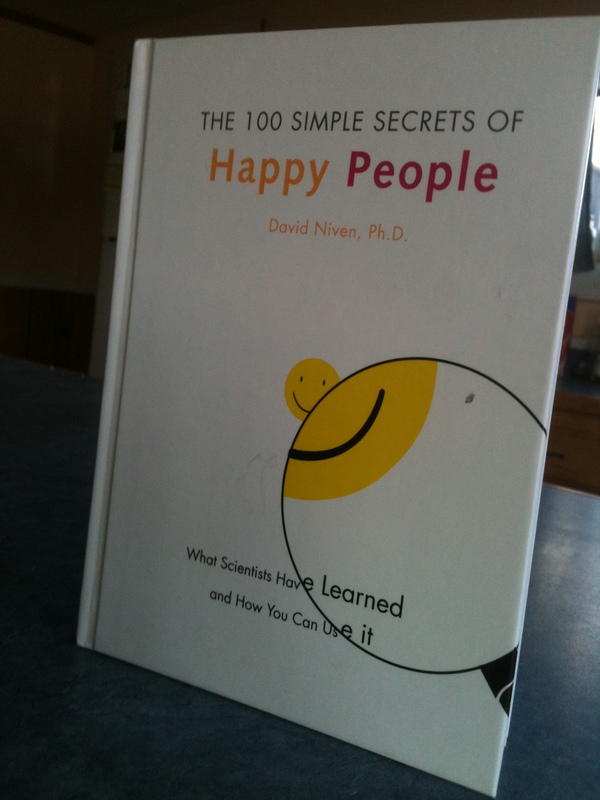 Some of those ideas are captured quite pithily in a book my sister Peggy sent me, The 100 Simple Secrets of Happy People: What Scientists Have Learned and How You Can Use It,” by David Niven, copyright 2001. For example, # 16 is “Believe in Yourself.” #17, however, is “Don’t Believe in Yourself Too Much.” Gotta love it. In England, the New Economics Foundation — originators of the Happy Planet Index — has developed five keys to happiness: lifelong learning, connection with others, mindfulness, physical activity, and giving to others. There’s a lot of good information at their website. The Pursuit of Happiness project — a group of academics with a mission of teaching us all to be happier, has seven correlates to happiness: relationships, caring, exercise, spiritual engagement, positive thinking, flow, and strengths and virtues. Click on the science of happiness tab at their website http://www.pursuit-of-happiness.org/ for a fuller explanation. Bhutan‘s Gross National Happiness policy grid for determining whether policies will actually lead to greater well being for the Bhutanese has nine pillars and 72 indicators. Most of these measurements fit well with our western culture. Much more simply, I recently read that there are just three happiness fundamentals: feel good, do good, and be good. Voila! That’s all there is to it! 1. Connect with others: a few close friends, or a large community. 2. Eat well, & get a good night’s sleep. 3. 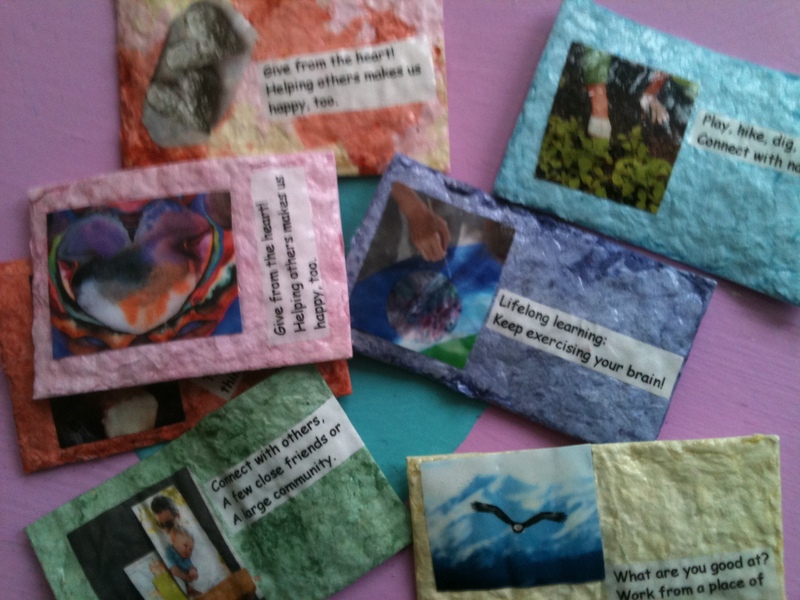 Give from the heart! Helping others makes us happy, too. 4. There’s so much to be grateful for! Be sure to say thanks. 5. Stay physically active. Take care of your body! 6. Play, hike, dig, breathe, swim, ski: connect with nature. 7. Get in the flow: create, exercise, sing, concentrate. 8. Measure your happiness. Truly! We focus more on things we measure. 9. Foster a positive outlook. Optimists are happier! 10. Resilience: bounce back when bad stuff happens (‘cause it will). 11. Be creative! Write, garden, solve problems, paint, dance, cook! 12. Be a lifelong learner – ie, keep exercising your brain! 13. Mindfulness: Be aware of the world around you, and within you. 14. What are you good at? Work from a place of strength. 15. Happiness is universal AND unique. What makes YOU happy? 16. Tread lightly on Earth. If Mother Nature ain’t happy, ain’t nobody happy. 17. Have a purpose. A meaningful life is a life with meaning. 18. Nurture your spirituality, whatever that means to you. Phew!! So many ways to be happy! I’m sure you all have more, and I would love to hear what they are.